where n is the generation (starting at 0), and the sign of the coefficients in the expression for y are chosen to yield the different branches of the family. In the diagram above, if you choose all positive coefficients, you get the curves on the extreme left, while if you choose positive for the first term but negative for the rest, you get the curves on the extreme right. The curves formed by choosing alternate + and - signs are the ones most closely related to the 'scrambler' that got this started. 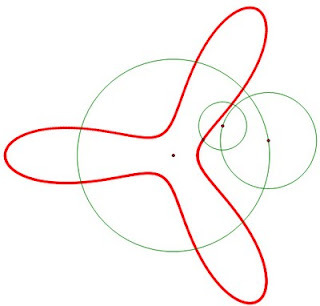 This choice has each circle turning in the direction opposite to the circle that preceded it, and generates the 'propeller' curves that lie in the center right of the diagram above. 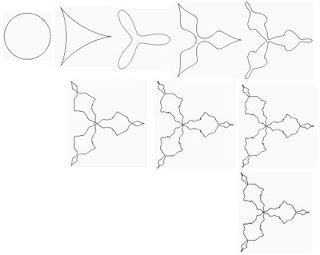 Looking at the images above and the one below, you can see that as n goes to infinity a fractal emerges that displays nice self-similarity along each propeller blade. 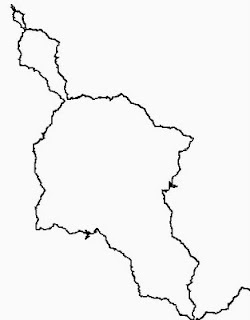 A text file with the Processing source code for drawing the fractal is here. 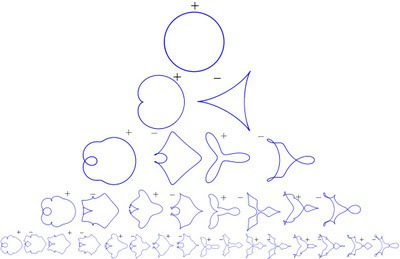 Update: A post about the leftmost curve on the chart above ("brain fractal") is here.